Today I'm delighted to feature a guest post by Lesley Vos about basic Ukrainian phrases. If you've got Ukrainian friends or are planning a trip to the country, then the 100+ phrases you learn here are sure to come in handy! By the time you finish this post, you'll be ready to have your first conversations and deal with common situations in Ukraine with confidence. Enjoy! 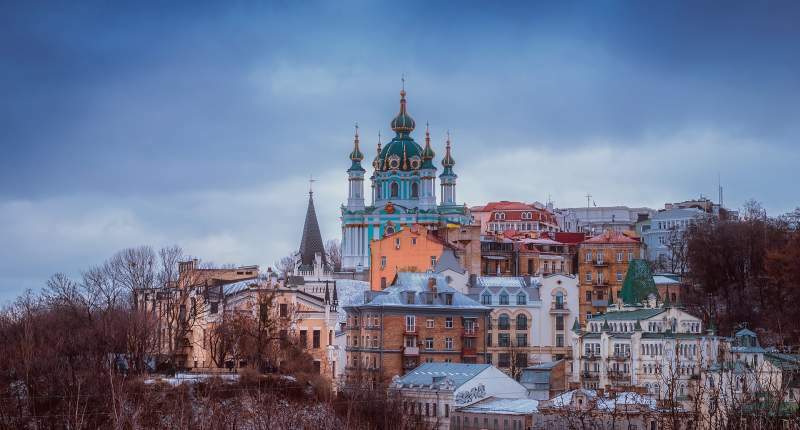 Even if you’re planning a trip to Ukraine, you’re not probably thinking of learning Ukrainian unless you expect to stay a long time. It’s one thing if you’re visiting for a number of months, but it’s hard to motivate yourself to put in so much effort learning Ukrainian if you’re just visiting for a few days. But whether you’re planning a short or a long trip to Ukraine, learning a little of the language is a worthwhile thing to do! Yes, most young people in Ukraine speak English; and they are responsive, hospitable, and ready to help. But if you speak some basic Ukrainian, your chances of enjoying the trip and understanding the local culture are significantly higher! Plus, the appreciative smiles you receive from the locals will more than justify your efforts to learn the basics! In this post, you’ll learn 100+ common words and basic Ukrainian phrases so you can have your first interactions in the language. By the end of this post, I bet you’ll have fallen in love with this beautiful language! Ukrainian is a rich language with dozens of words to meet and greet people. Of course, you don’t have to know them all when want to say hi; but being familiar with the most common ones will help you make a positive impression. 3. Доброго ранку! (dO-bro-ho rAn-ku) — Good morning! 3. Доброго дня! (dO-bro-ho dnja) — Good afternoon! 4. Доброго вечора! (dO-bro-ho vE-cho-ra) — Good evening! 5. Як ся маєш? (jak sjA mA-jesh) — How are you doing? 6. Як справи? (jak sprA-vy) — How are you? 7. Добре, дякую! (dO-bre, djA-ku-ju) — I’m fine, thanks! 8. А в тебе? (a v tE-be) — And you? 9. Не дуже (ne dU-zhe)— So-so. Ukrainians are open-minded people, happy to make new friends. Try these expressions to introduce yourself and get to know locals. 10. Дозвольте представитися (do-zvOlʹ-te pred-stA-vy-ty-sja) — Let me introduce myself. 12. Як тебе звати? (jak te-bE zvA-ty) — What is your name? 13. Радий познайомитися! (rA-dyj po-zna-jO-my-ty-sja) — Nice to meet you! 15. Звідки ти? (zvI-dky tY) — Where are you from? 16. 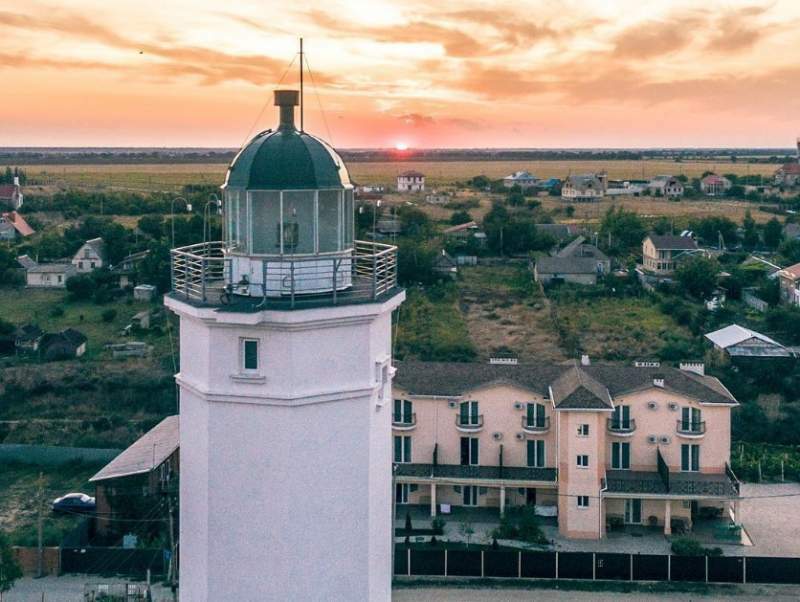 Скільки тобі років? (skILʹ-ky to-bI rO-kiv) — How old are you? 17. Мені 25 років (me-nI 25 rO-kiv) — I am 25. 18. Де ти живеш? (dE tY zhy-vEsh) — Where do you live? 19. Дуже приємно! (dU-zhe pry-jEm-no) — Nice to meet you! 20. Я іноземець (ja i-no-zE-metsʹ) — I am a foreigner. Naturally, if you’re going to keep a conversation going you can’t just talk about yourself! You’ll need to be able to ask a few questions too! Here are the Ukrainian question words you’ll need to learn? 21. Хто…? (khto) — Who? 22. Що…? (scho) — What? 23. Коли…? (ko-LY) — When? 24. Який…? (ja-kYj)/ Яка…? (fem.) (ja-kA) — Which? 25. Де…? (de) — Where? 26. Як…? (jak) — How? 27. Чому…? (cho-mU) — Why? 28. Скільки…? (skIL’-ky) — How much? 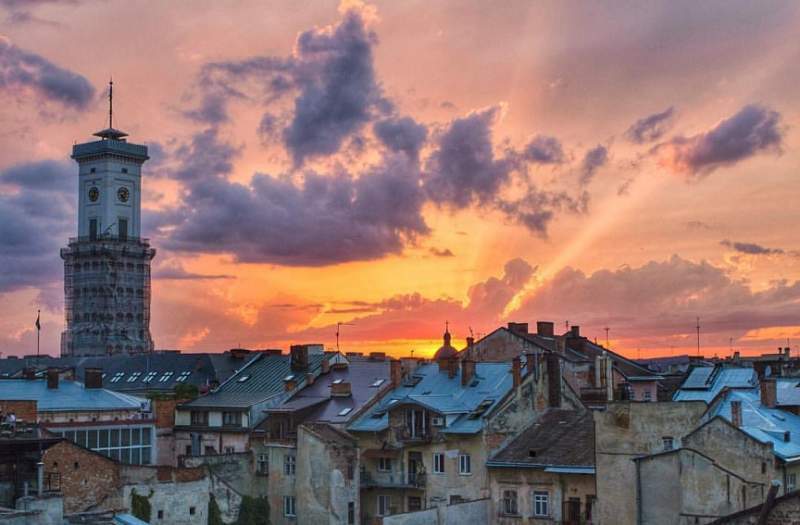 Once in Ukraine, you won’t want to miss the chance to walk and see the beauty of the cities and countryside. These words will help you to understand what buildings you see in front of you or ask people how to get there. 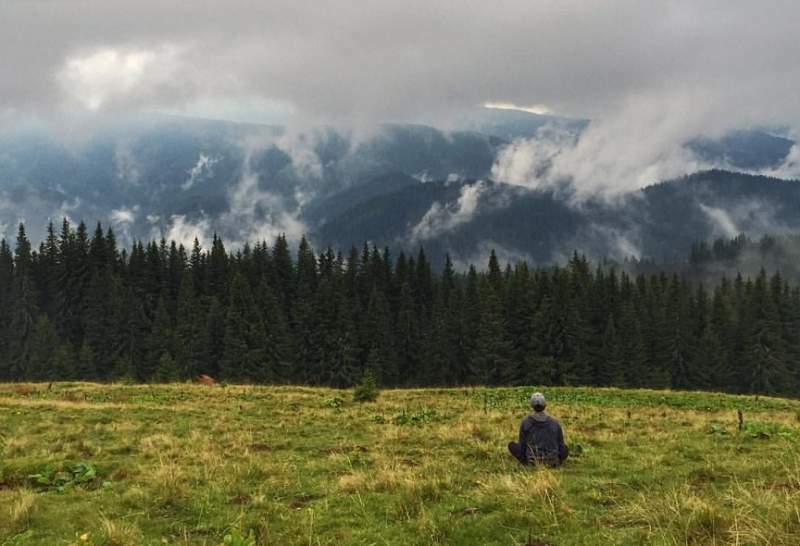 Ok, so know you know the names of the places you want to go, but what if you get lost? 42. Де це? (dE tse) — Where is it? 43. Це далеко? (tse da-LE-ko) — Is it far from here? 44. Туди чи сюди? (tu-dY chy sju-dY) — Is it this or that way? 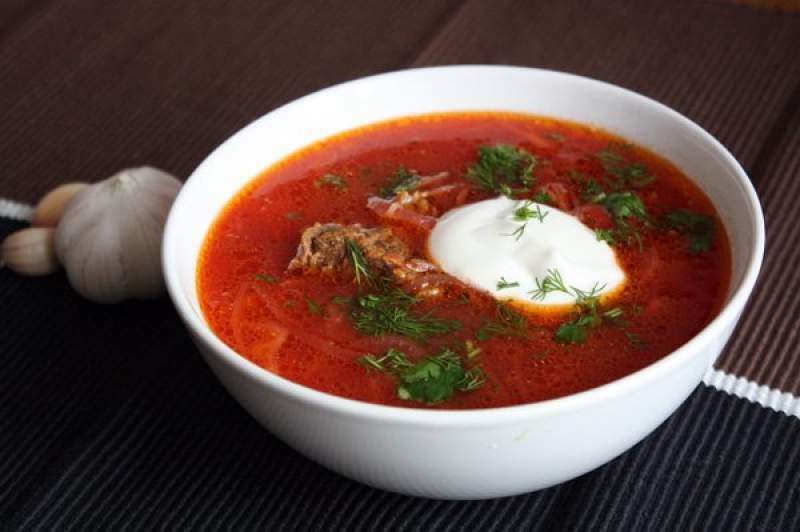 Do you know anything about Ukrainian cuisine? 75. Смачного! (sma-chnO-ho) — Enjoy your meal! Notice that Ukrainian letters Г and Х can have the same transliteration which is /h/ (although we use /kh/ for Х here). However, these are two different sounds: Г sounds somewhere between /g/ and /h/, while Х is more literally a /h/. 76. Вам допомогти? (vam do-po-moh-tY) — Do you need help? 77. Допоможіть мені, будь ласка do-po-mo-zhItʹ me-nI budʹ LAs-ka) — Help me, please. 78. Котра година? (kot-rA ho-dY-na) — What time is it? Of course, not every conversation will go smoothly. What should you do when you don’t understand something? Or if you need to ask someone for help? It’s important to know some basic phrases you can use for dealing with problems when they arise. If you need someone to speak more slowly or to repeat something, the best thing to do is just ask them! Don’t worry about your accent: no one will laugh at you if you speak slowly or make mistakes! 81. Я вас не розумію (ja vas ne ro-zu-mI-ju) — I don’t understand you. 82. Ви розумієте мене? (vy ro-zu-mI-je-te me-nE) — Do you understand me? 84. Повторіть, будь ласка! (pov-to-rItʹ budʹ LAs-ka) — Could you repeat, please? 87. Що це? (scho tse) — What’s that? 88. Що це означає? (scho tse o-zna-chA-je) — What does it mean? 89. Говоріть повільніше, будь ласка (ho-vo-rItʹ po-vilʹ-nI-she budʹ LAs-ka) — Could you speak slower? 90. Ви говорите англійською? (vy ho-vO-ry-te anh-LIjsʹ-ko-ju) — Do you speak English? 91. Як туди пройти? (jak tu-dY pro-jtY) — How can I go there? 92. Що з вами? (scho z vA-my?) — Are you okay? 93. Що ви хочете? (scho vy khO-che-te) — What do you want? 94. Скільки це коштує? (skILʹ-ky tse kOsh-tu-je) — How much does it cost? No matter what language you speak, politeness goes a long way towards making a positive impression. 95. Дякую! (djA-ku-ju) — Thank you! 96. Дуже дякую! (du-zhe djA-ku-ju) — Thank you very much! 97. Будь ласка! (budʹ LAs-ka) — You are welcome! 98. Нема за що! (ne-mA za scho) — My pleasure! 106. Молодець! (mo-lo-dEtsʹ) — Well done! 107. Вітаю! (vi-tA-ju) — Congratulations! 109. Овва! (Ov-va) — Wow! 112. Агов! (a-hOv) — Hey! 114. Якого дідька? (ja-kO-ho dIdʹ-ka) — What the hell? 115. Тьху на тебе! (tʹkhU na tE-be) — Darn you! There are some words that don’t fit nicely into any one category. But, they are common, and you probably won’t be able to communicate much without them. 121. Звичайно! (zvy-chAj-no) — Sure! Whether you like it or not, the time will come to say goodbye to your new Ukrainian friends! 126. Бувай! (bu-vAj) — Bye! 127. Па-па! (pa-pA) — See ya! 128. До завтра! (do zAv-tra) — See you tomorrow! 129. До зустрічі! (do zU-stri-chi) — See you soon! 130. До побачення! (do po-bA-chen-nja) — Goodbye! 131. Всього найкращого! (vsʹo-hO na-jkrA-scho-ho) — All the best! 132. Будьте здорові! (bUdʹ-te zdo-rO-vi) — Take care! 133. Гарного вечора! (hAr-no-ho vE-cho-ra) — Have a nice evening! Among the most fascinating aspects of any language are its idioms. There are expressions with particular meanings that are different from the meanings of each word on their own, and they can often sound funny and illogical. But isn’t that what makes them interesting to learn them? English is rich in idioms, but so is Ukrainian! As you may have noticed, some of these idioms have words with the letter Ї in them (such as з’їсти or сивої). This is a unique letter of the Ukrainian alphabet, which doesn’t appear in other languages that use Cyrillic. It’s one of the things that makes Ukrainian so melodic. Pay attention to its pronunciation: it’s /ji/, not /i/ or /y/, so you might need to practice a bit to sound like a Ukrainian. So there you have it! 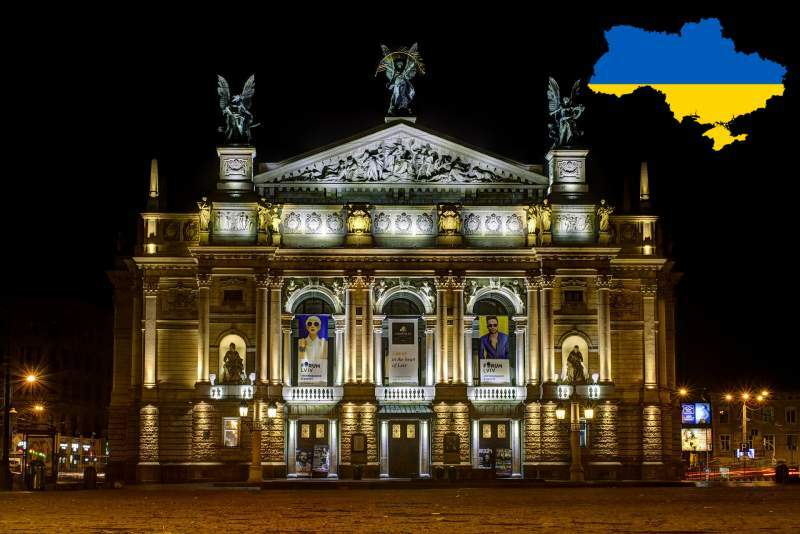 – 100+ words and basic Ukrainian phrases for you to start an unforgettable trip to Ukraine. With these phrases, you will be able to have basic conversations in this beautiful language as well as understand the locals and get inspired to learn or improve your Ukrainian. Lesley Vos, a web writer and blogger behind PlagiarismCheck.org. 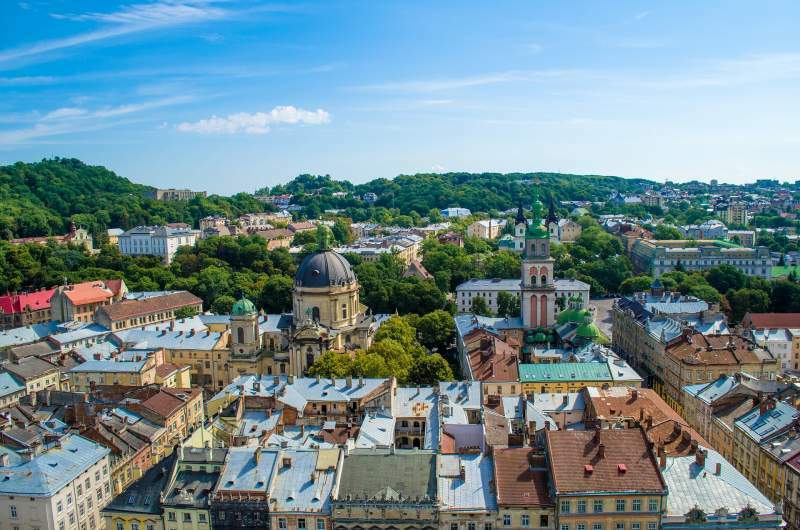 A self-proclaimed bookworm and coffee addict, she travels a lot through her heart lies in the Ukrainian city of Lviv. See more of her work and say hello on Twitter. Are you learning Ukrainian? What's your motivation to do so? Let us know in the comments below!